The HRD Ministry will soon launch 50 DTH educational channels. This was stated by the Secretary (HE) Sh Ashok Thakur in New Delhi today. He said these channels will be different from the existing programmes on air including Gyan Darshan as new one will be more interactive. He said these channels will air programmes which will be live and not pre recorded. Saying that the new initiatives will be one of the largest anywhere in the world of its kind, Sh. Thakur said later on the number of the channels will be increased to one thousand. He said that the Ministry has spent more than one billion dollars for ICT. Over 400 universities and twenty thousand colleges have been linked with bandwidth. He said there is a great potential to increase its usage. Highlighting the potential of the National Programme on National Mission on Education through Information and Communication Technology (NMEICT), the Secretary said that the entire country can be made into a big classroom which will help improve quality of instructions in engineering colleges particularly belonging to the remote areas. He said that the Ministry may approach AICTE to make on-line education mandatory and integral part of education system. Asking to promote virtual lab, Sh. Thakur said it should be possible to share classes from IITs to other engineering colleges by making the system more user friendly. Dr. S.S. Mantha, chairman, AICTE focused on promoting quality initiatives in the country. He said that rapid expansion in institutions has led to the decline in quality. The need of the hour therefore is to nurture quality in the institutions. 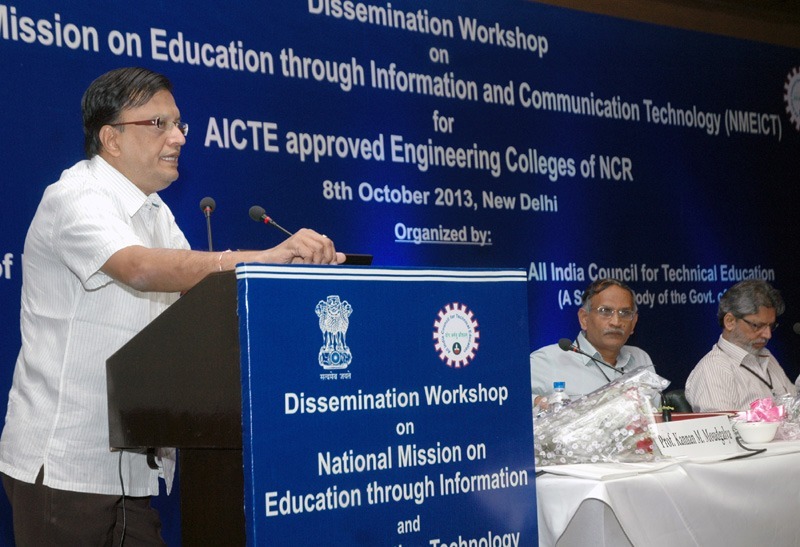 The one day workshop was organized by the HRD Ministry with AICTE. More than 150 engineering colleges from the National Capital Region of Delhi participated in the programme.